Dust, sun and rain can damage all the components of your Miniplane Paramotor! Plastics, belts and propeller can become fragile from exposure to the sunlight. Dust, fire soot, salt spray, bird poop, dog pee, leaf blowers, drizzle, alien scum, nuclear fallout, windshield wiper blowback, pollen, worms and insects all conspire together to deteriorate your precious flying machine! If only there was a simple solution to protect your favorite plaything. Now there are some solutions to this problem! Cover works with your motor fully set up, or use the convenient zipper closure for when your motor is partially assembled (Upper Sticks and Prop still attached as shown in larger pictures). New Grey color fits the regular Miniplane Flex Frame models. 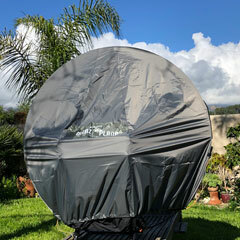 Protect your Miniplane from sun and rain with this lightweight cover! Not for use on car rack (outside) while driving. Weight: 400gr. Fits cages up to 55" across. This is our lightweight Paramotor Cover, with "I Love Flying" embroidered onto it to tell the world about your passion. Cover works with your motor fully set up. Click photo at left to see larger photos. Not for use on car rack (outside) while driving. Protect your Miniplane from sun and rain with this lightweight cover! Weight: 400gr. Fits cages up to 54" across.